The six of us are pretty close in age (there are 12 years between the oldest and the youngest), but with all of getting married and having babies and moving to different states, we only get together with all of us once a year. 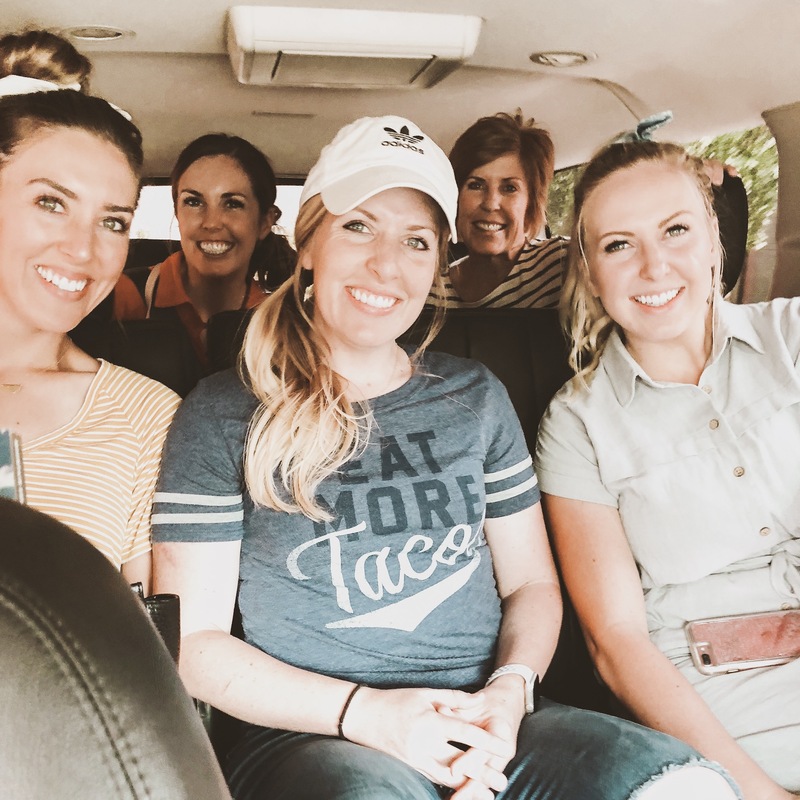 This year, we decided that we would really get away – no husbands, no kids (well, minus Jameson because he’s still so little) and enjoy our time together with a little pampering and self-care. Lauren and I were put in charge, and we decided that we would make this weekend one they would never forget. We rounded up all of our favorite things, titled it our “luxury retreat” and got to planning. It was so fun putting it all together, and we loved showing our sisters some of our favorite things (and surprising them with our favorite things, too). We started our day off at our very favorite Mindful Women Spa and Medical! If you’ve followed us for a while you know this is our go-to place for relaxing and all things beauty. We were all about relaxation on this trip so opted for 60 minute massages and one 60 minute facial for Lauren (she’s still in her first trimester, so she couldn’t get a massage). It was so nice to start our girls weekend off focusing on ourselves and relaxing. It was our moms first massage and she walked out half asleep but so happy! The first thing she said to us was “I’m converted!” Mindful Women Spa and Medical has such a relaxing atmosphere and it really feels like you step out of the world for few hours. We’ve done a few different treatments at Mindful Women. 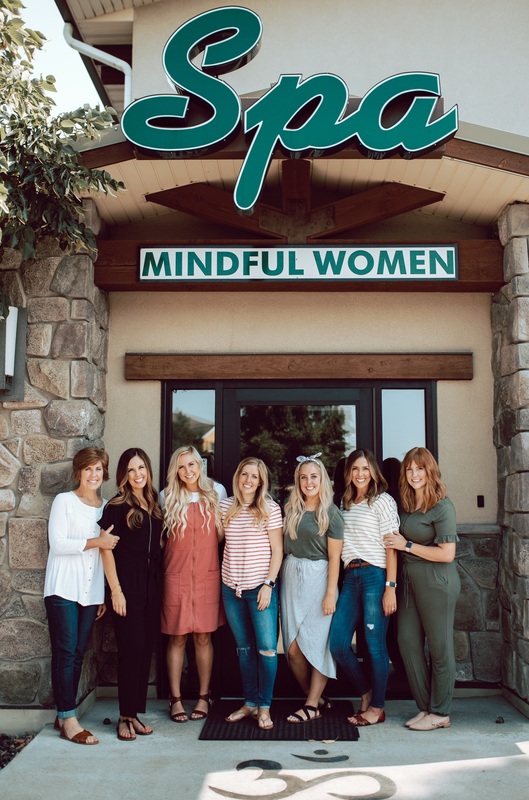 You can see some of our before and after pictures on Mindful Women Spa and Medical’s Instagram account. With this being our one relaxing, kid free getaway of the year together we wanted to take every step we could in assuring we didn’t have to worry about one thing. Lyft picks you up wherever you are and drops you off wherever you want to go. Using the Lyft App on your phone you can call a ride when you’re ready, or even schedule a ride for later. My early morning Lyft ride to the airport was scheduled three days in advance, so I didn’t have to think twice! It was so much fun not having to worry about who was going to drive, where we were going to park, and splitting up to get from place to place. Lyft took care of all of that so we could just show up, enjoy ourselves, and relax. We used the Lyft XL to make sure all of us could ride together in one of their larger cars. We rode to and from the airport, around Farmington and Salt Lake City, and all the way up to Park City. It never took longer than 10 minutes for our rides to arrive, and the drivers were all so kind and accommodating. We’d recommend Lyft for a night out, a ride downtown, to the airport, or just around Salt Lake City! It was so much fun and definitely an experience we will be taking advantage of at our next sister retreat. If you’ve been around here long, you know how much we love food! Obviously eating good food was high on the list of priorities for places we wanted to go and things we wanted to do. We stopped at Blue Lemon in Station Park for lunch. If you’re ever in the area, we’d highly recommend it. We love the Short-Rib Grilled Cheese, Steak Street Tacos, and Black Bean Ravioli. We don’t share a lot of behind the scenes in our kitchens, and something you probably didn’t know is that we usually use the same 10 or so props for all of our photos. 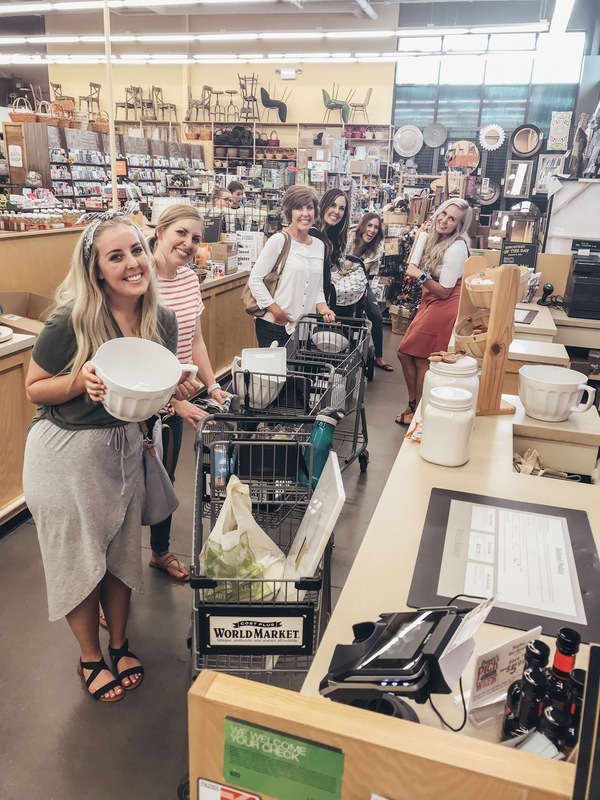 Our favorite place to shop for cute props and home goods for every day cooking is World Market. They have such a unique collection and the most reasonable prices! From kitchen to bedding to patio furniture they really have it all. We stopped at World Market after lunch and it was so much fun to shop for props together, that’s definitely something we’ve never done! Most of us ended up with the same cute mixing bowls and wooden measuring spoons. We’d highly recommend them, food photographer or not. 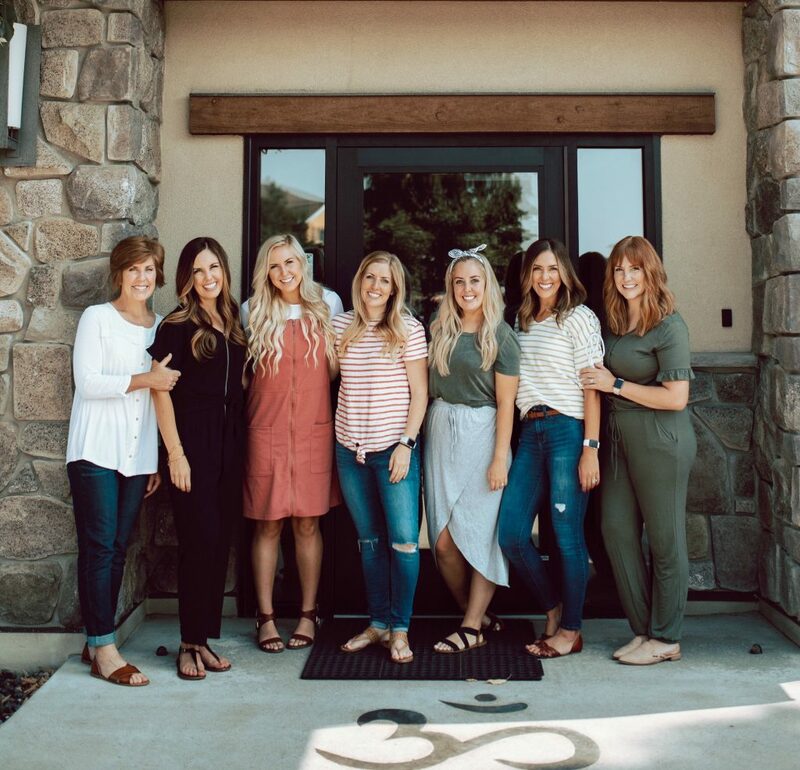 See if you can spot the World Market prop that EVERY sister uses in these pictures. We have always loved Park City – and we would go up there every fall as a family to shop, eat, and swim in the beautiful fall weather. When we were planning where to host our retreat, it was our very first thought. A few of us had stayed at the Newpark Resort when we were up in Park City for a half marathon, and we loved it so much we thought we’d stay there again. We stayed in one of their townhomes, which was perfect to sleep all 7 of us (and a baby). It was so nice having 3 bathrooms, multiple bedrooms, and a full kitchen so we could have a fun Facebook Live demo while we were up there together. We knew Park City had a ton of tasty places to eat, and like I mentioned before, this was a top priority! We asked all of you for your recommendations and you did not disappoint (if you missed that post on instagram, you can see it here). Like we mentioned before, Lauren and I wanted to surprise everyone with the BEST swag we could think of! We reached out to all of our very favorite companies, and surprised each sister with a goodie bag. We could not keep it a secret from my sisters for more than five minutes when we got our Fawn Design Original bags. We’ve been a huge fan of everything Fawn Design from day one (how can they even make fanny packs look good?! ), but we cannot get over their brand new design on their original bags. 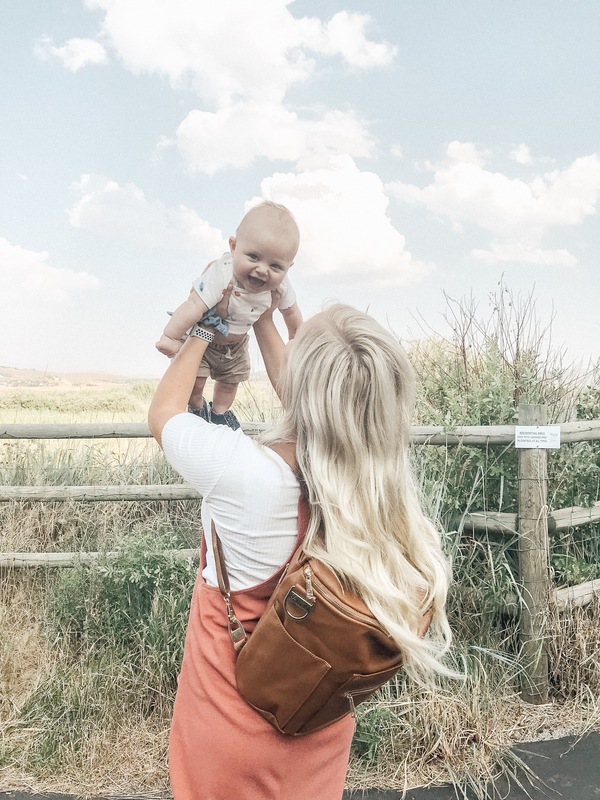 They make the perfect diaper bag with multiple pockets inside and out, but also makes a perfect every day bag! It can be worn as a backpack, or over the shoulder with removable and adjustable straps. The Fawn Design Original comes in four colors. We loved them all so much we ended up ordering a variety of colors for the sisters, knowing they’d be happy with any of the bags! Now we’re just counting down the days until we can order Lauren’s little baby a Fawn Design Mini! We don’t get to be together as sisters very often, so I wanted to make this time special. We’ve had a lot of changes over the last year with two sisters getting married, two sisters moving, one sister having a baby, and another sister expecting. We’ve followed Made By Mary for as long as we can remember and have been in love with all of her pieces. We love her jewelry because you can personalize it to fit your style, trial, or message. We decided to go with necklaces engraved with the word “mom” for our mom and the three oldest sisters, and then initials with our husbands names for the youngest three. Although they were engraved differently, our Half Moon Hammered Discs were all exactly the same. It felt so special to all wear such similar pieces. It has connected us even though we live hundreds of miles apart! It wouldn’t be a luxury retreat without luxury blankets, right? I was definitely most excited about these Saranoni blankets. I bought a receiving blanket for Jameson when he was born and I have been obsessed with them ever since. I even started sneaking it for myself when he was sleeping because it. is. so. soft! Emily (who runs Saranoni with her husband) is literally one of the kindest, most genuine people on the planet. Their team took such good care of us, and were even kind enough to embroider our names on our lush blankets. If you win the giveaway, you’ll get to pick a blanket of your own, but if you can’t wait – they offered a discount to all of our readers! Use the code SIXSISTERS20 for 20% off your order through the end of August! 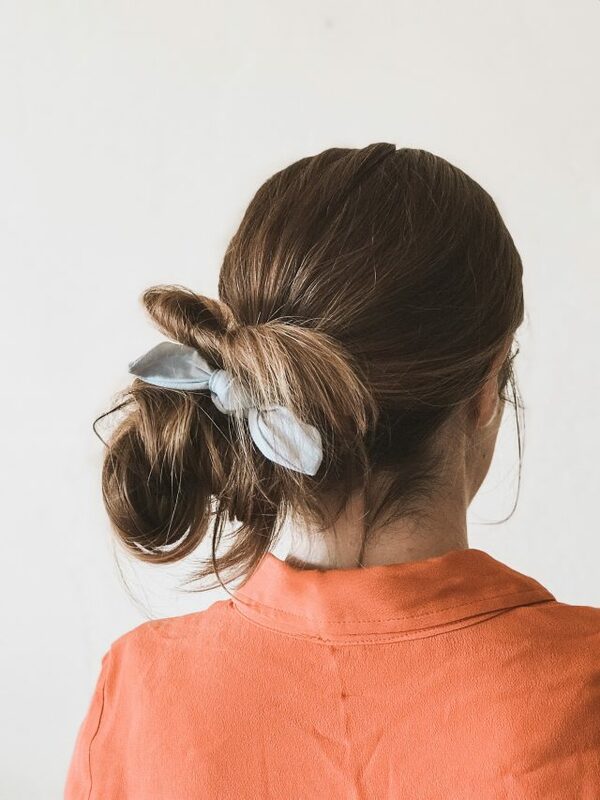 We are loving the scrunchie trend right now, and we thought it would be fun to get a bunch of scrunchies that the sisters could mix and match. My Bonjour Bobby sent us these adorable scrunchies and if you look closely in the pictures from the weekend, you can see one or more of us wearing one at all times! You may know Letterfolk for their amazing letterboards (we obviously love them for menu planning and baby milestones), but did you know they have a whole collection of paper goods as well? 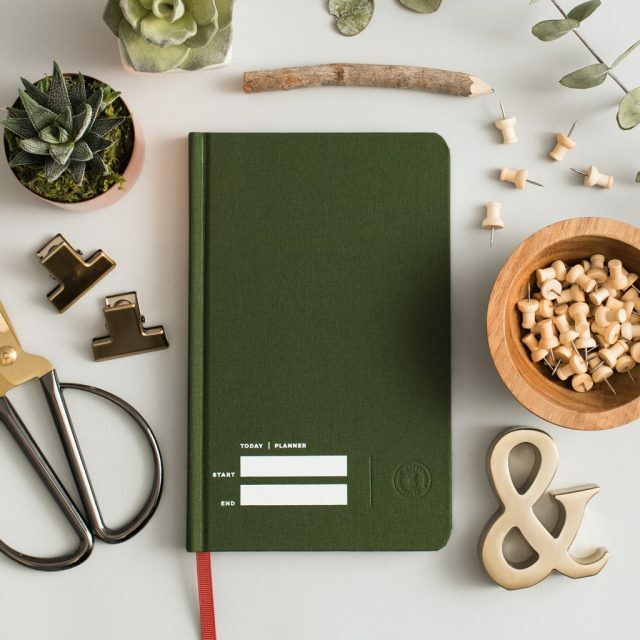 We knew we wanted a good planner for all of the sisters to use, and Letterfolk sent us the most gorgeous hard-cover planners. Now I’m thinking I need a pocket-size, too. If you haven’t noticed by now, we are definitely inspired by so many amazing women and women-owned companies. We LOVE Gigi Pip – not just because their hats are INCREDIBLE, but because they are dedicated to women who wear many hats (just like each of us!). 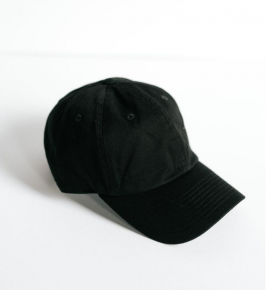 We each got one of their baseball caps to wear while we’re on the go, chasing kids, or throwing together a quick dinner in the kitchen. We knew that we wanted to surprise the sisters with some DELICIOUS treats, so in addition to some Swig catering (did you know you can do that?!) 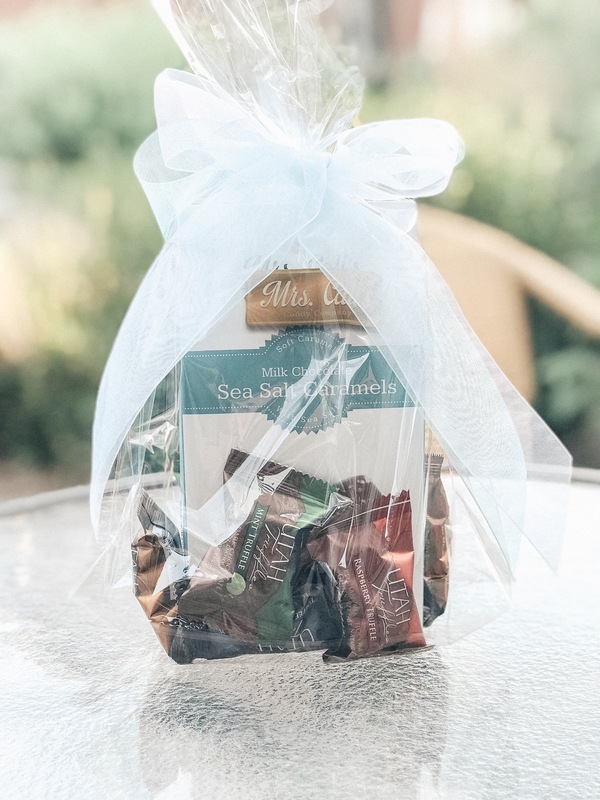 – we talked to our friends at Mrs. Call’s for some AMAZING chocolates. They sent us some goodie packages with their world-famous Milk Chocolate Sea Salt Caramels and their Utah Truffles. I planned on taking some home to my family as a little gift, but I totally ate them all before the day was out. I just couldn’t resist! We had a great time as sisters, and we wanted to share a little bit of that fun with you, so we decided to give an extra swag bag away! I've loved your meal plans for years now! Thank you for making my life easier and my family's bellies full of yumminess!! Looks amazing! Doing something similar soon with my SILs! Love all the easy recipes for my family. It's wonderful too see such a positive and loving family of sisters doing what they love! Amazing giveaway! Thank you. Love your videos and meal plans (totally takes all the guesswork out, which makes my life easier). These all look amazing! I would love to win so I could feel pampered and ready to go for the upcoming school year! First graders can take a toll! ? plus a little me time never hurt nobody, right? Just recently found you ladies! What can I say? Better late than never? Oh my! Such amazing things to share! Thank you so much Sixsister’s Stuff!! ? This is amazing! I cant wait to try all of this fun stuff with my sisters! What great ideas and fun stuff. So awesome! I’m excited about everything actually! Especially the blanket and the Albion suits! Generous giveaway! Thank you, girls!! This is amazing! And such wonderful things to share!!! This is so fun! My MIL gave me your book for my birthday. I love all the recipes. I would love to win everything! But mostly the cookbooks ? Everything looks amazing. What a fun time for you girls! Definitely my favorites are the purse and blanket! You can never have too many soft blankets. And my purse recently broke! Thanks six sisters for doing this giveaway!! So many exciting goodies! I would it all but mostly the hair accessories, chocolate, and the bag!! I agree! Amazing giveaway! ? I just signed up for the weekly meal plan and am loving it! This is an amazing giveaway!! Thank you so much for doing this giveaway!! It looks so relaxing and like a perfect girls night out, and do much fun! I’m excited to continue following your pages to see what other cool things you do!! This giveaway is all the things after my own heart! A new bag, chocolate, planner?! YASSSS! Plus it comes from a platform that I love. You guys are awesome. Amazing giveaway! Fingers crossed ?? How fun! Such cute stuff! I love y'alls giveaways. I love using your recipes for family events as they are always a big hit! I’ve loved you guys forever! I have two of your books but want them all because they’ve become our “go-to” recipes! So many amazing goodies! Crossing my fingers! ? ?Love your guys’ cookbooks! This is amazing!! I would love all of these things. I love your girls stuff! I have two of your recipe books and cannot wait to get more! Fingers crossed ? I'd love to win the swimsuit because finding modest swimsuits is so hard! You girls are amazing! I love everything you do! Love all this stuff! You ladies are awesome! Amazing! Everything is amazing and I would live it all!!! ? Amazing! Everything is amazing and I would love it all!!! ? Omg! First the wonderful meal plans and recipes and now the most amazing giveaway! ????? ?I’m a winner! Oh how I would love to win! Your recipes are always a success! All of you are always looking so cute!! What a wonderful giveaway! Thank you! My sisters, mom and I need to do a girls getaway! So much fun stuff! Thanks! Looks like a lovely getaway, well done! This is an amazing gift. So excited if I win to get the purse and Blanket. I would love the cook books and world market for the giveaway! Love it all! Gosh you girls are the cutest thing ever!! Love everything in this swag bag and would just die to win my first giveaway ever being the best ever!!! Love you beautiful girls!!!! Thank you for hosting such amazing giveaways! This looks like the perfect sister retreat! This is amazing! You girls are my go-to for every recipe! I love this giveaway, there's so many fun things! I'd enjoy everything, but the first thing I'd do is have some chocolate while looking through all the cookbooks! PS, we have the smaller family healthy meal plan and all the meals have been delicious! Thanks! What an amazing swag bag! And an awesome sisters weekend ❤️ Putting in as many entries as I can!! I have 2 older sisters and I adore them. Your relationship reminds me of us and I love watching you guys celebrate each other's gifts and lives. Thanks for sharing this all with us! Super excited about the fawn design bag!! ?? Sounds like you guys had a great reunion! Thank you for doing this amazing giveaway! I think the bag would be my favorite prize because I'm due Nov 2nd with baby #3. I love being organized! Love this giveaway and all you Sisters! Saranoni blankets are the BEST and I could never have enough of them!! Ps. Baby J made all these pictures ??????! Love this giveaway!! The recipes you post are amazing!! I wish I was on that trip! & this giveaway is AMAZING !!! ?? You gals come up with the best ideas! What a fun giveaway! I come from a family of four girls, so it is so fun to follow all you sisters. Thanks for all the good that you bring to Instagram, the internet, and the kitchen! What a great collection of products! I think I’m most excited about the bag from Fawn Designs! I love all your fun and real recipes! Such a fun giveaway! Those blankets look heavenly. This is amazing! ❤️ Our meal plans!! They have saved me! I love your website and your menu plan. I recently started using your menu plan and I tell everyone about it. Best thing ever! I would love to win everything above especially that soft cuddly blanket and the chocolate. I love everything Six Sisters! My sisters, mom, and I do girls trips too, and they are definitely a highlight!! So fun! This is the best giveaway!!! I’d love everything but Albion is my favorite! Your book! I love inspiration and it looks SO FUN!! Thanks so much for the give away! The weekly menus are great too! Thank you for such an awesome giveaway! I have a couple of your cookbooks ? I Love all of your cookbooks a your cookbooks and your videos you have been posting on Instagram and Facebook! This is such a fun idea! I love all the cute stuff you put in the bags! Looks like a blast!! I have three sisters and always love getting together with them! I enjoyed following you on your vacation, you sure looked like you all were having fun. This is awesome!!! I love how close you gals are and the fun ideas you all have. Your recipes are my favorite! (My husband’s too). I would love to win!! The bag looks great! And I cannot wait to get my hands on those books! I remember watching your Instagram stories and posts about your trip and I was/am so jealous of the amazing swag you each got. I am crossing my fingers that my name will be drawn. Everything sounds awesome but I would love all of your books! They've become a staple in my meal planning. This is an amazing give a way! I love the relationship you all share, it reminds me of me and my sisters! My last trip I shared with my mom before she passed away was a mom and sisters trip to park city and it is a trip I will treasure always! How awesome!! I’d love all this stuff. This is an amazing giveaway! What an amazing fun giveaway! Thanks for the chance! Thank you for such an amazing giveaway! ? Wish I was a Sister!! How fun! So many awesome things! Love your smaller family meal plans. So helpful and time saving for me. Love your instant pot recipes on you tube! Best sister to have around is one that knows how to cook! I love your menu plans. It would be awesome to win this! Girls trips are the absolute best!! ❤️ Love all of your favorite things and I know my sisters would too! Thanks for sharing! How fun! I think the bags look super cute! This is great- love the sister time and the awesome giveaway! What a fun weekend getaway! I always wanted a bunch of sisters...now I have friends who are just like sisters. We may need to plan a getaway for us. Thanks for the fun giveaway! Lots of great stuff! I think a girls trip is just what me and my sister in laws need. I'm an only girl but sure love my sister in laws. They are pretty great sisters just took a while to find their way into my life. The fawn back pack would be amazing as would everything else. This is so much fun! What a great tradition with sisters and so much good swag. I am a sucker for baseball caps and a soft blanket. thank you for your recipes, every single one I've tried has worked out perfectly and my husband 100% trusts me any time I recommend trying a new one! How fun! I’d love all the cookbooks! I would love the Albion fit to be able to try abnew swimsuit! All of this sounds amazing!!! I have three sisters, would so love to do this! I’m obsessed with all of it, but anything cooking is especially great to me. I am a special ed teacher, and cooking really relaxs me after a busy day and helps me focus on making the next day great for my students! I would love to win! I absolutely love following you cute girls and getting yummy recipes each week! My favorite would be the cookbooks! Love your recipes! What an awesome getaway and giveaway! Have sisters I know how important it is to get away without the kiddos and husbands to reconnect! Sisters are the best! Oh. My. Goodness. So many cute things! But I about died when I read about getting the cookbooks! I would never have to meal plan scour the internet for hours for recipes again! What a lovely contest, thanks! ❤ all of these things in the post! You guys are the best! I absolutely love you guys and your recipes. Awesome giveaway!! Sisters and sister weekends are the best! Would love the blanket to wrap up in! This giveaway is amazing! I’d love to win!! I can’t even decide what my favorite prize would be because they are all amazing! Love your cookbooks! I’d loooove to win! Such an awesome giveaway! I’m normally not one to do these but this whole thing is amazing! I’d love the bag and blanket most!! Looks like so much fun, my family of six girls love going on girls trips with our mom too! How fun ladies! A little pampering never hurt anyone and this is just so kind of y’all! We are planning our first Park city trip for this October! So fun! I would love to get necklaces for my sisters and mom! Love your weekly meal plans! Would love to win this too! Thank you! Sounds like so much fun! I would love to shop at World Market! Such a fun giveaway!! Love your recipes! What a great giveaway! I would give some of these things to my sister in law who is due in March! Can’t wait to see who wins! Good luck everyone! I would love to get any of it! Love it all! This would be amazing! You guys are so cute! I would love the Albion Fit money! Such cute suits! Such a fun trip! What an amazing experience! What a fun weekend. I want to do the same with my girls when they are older. I'm so excited! Hoping for a win! How fun!! Love Park City! This giveaway is amazing! Love following you guys. Such a fun giveaway!! Would LOVE to win this ?? This all looks amazing! My little sis has an Albion swim suit and it’s adorable and my 8 year old still has his Sara Noni baby blanket! This would be amazing to win! ♥️?? Excited! Looks like a fun get away too! This would be awesome to win! You ladies are inspiring and make such yummy food! Sounds like such a fun weekend. This would be awesome!! This makes me want a girls trip so bad! I only have 1 sister but hoping I have a bunch of girls one day to be able to do these kinds of things when they grow up! This has got to be the best giveaway I’ve ever seen! I would LOVE an Albion swimsuit! So cute! I got caught up browsing their site. So many cute things!! Thanks Six Sisters for sharing the love! I’ve tried several of your recipes and they all turn out great! I’m a new mama who loves to treat myself when I can! So many awesome things! What a fun give away! Love all of your recipes and the recipe books I have of yours! It would be so awesome to win all 7 of your recipe books and more! So kind of you! Good luck to everyone! The bag would be fun because I'm known as the bag lady! Can't have enough bags! Lol! This is so awesome! Thanks for sharing!? I love your recipes! I just bought your healthy meal plan! I love following and hearing how close you all are! This is an awesome giveaway! Love this... there are 5 girls in my family and we have the BEST time together. Live the idea of a swag bag! We do a girls weekend every big birthday..30, 40, 50.. etc.. but we are close too... so we get together about every 2 years..just the girls !! We see eachother throughout the year with our families...i like the idea of every year though!! Thanks for all your fun ideas and recepies! I love this! I love getting together with my sister's too...obviously slightly more budget friendly ? Y’all are such cute girls and a wonderful family. I love following you. Thanks for sharing these fun sites! What an awesome giveaway ? I have purchased several of your cookbooks and absolutely love the recipes that I have made from them and have become our family favorites. You all are so darling. How fun to be able to work together with all your sisters. Love a sister’s get- away! What a great give-a-way!!!! Thanks for sharing your families with us and for a chance to win this great giveaway! This is an amazing giveaway! I love Six Sister Stuff!! Oh my word! What an amazing giveaway! This giveaway looks amazing! I love Six Sisters Stuff! Such an amazing giveaway! I am most excited about everything? ?I’ve always wanted a fawn bag and a necklace from made by Mary! Would love to win. Love following your page! I love your healthy menu plan and would love to have your cookbook collection!! Thanks for the awesome recipes! What an awesome giveaway!! I love your recipes! Many of them are staples away my house! What?! I’m dead?? the cutest giveaway!! I would love this! Some of my favorites for sure!! I love you guys! Your recipes are all so yummy and my kids will eat just about everything I have made! How fun that you get to do a sister retreat! Thanks for the giveaway! What a generous giveaway! Your recipes are always my go-to’s. I loved following along with you during your retreat- I’ve always dreamed of having a large family and being close with sisters. You girls are so lucky to each have five built-in best friends!! Sounds like a perfect getaway!! This giveaway is amazing!! ❤Six sisters! You are all so awesome so of course you would have an awesome giveaway. Love everything in it! I love how you enjoy being with each other!!! I love following you on Facebook, Pinterest and Instagram and you tube!! Is it weird to do an exact replica of this getaway but with your five brothers? This is so awesome! Looks like some great stuff!!! Wow. What an excellent giveaway. All of those goodies would be amazing to get. My sister and Mom and I will be taking a trip together in October. I can't wait to spend that time with them! Your swag bag is an awesome idea and has incredible items, might need to do something like this for them! Oh my! I would love to win the bag so I can use it in my classroom! I would love to win the Fawn Design bag the most. I have really been coveting one for ages, but don't have the strength to lay that money down! This entire giveaway is so amazing though! I would love the Saranoni blanket!! Awesome giveaway! I love alllll of these things!! What a fun giveaway! Girls weekends are the best! So fun! The bag looks awesome! Looks like a great give away and such a fun girls trip!!! This is a fantastic giveaway. Don’t know where I’ve been, but I didn’t realize you guys had cookbooks. All the ? for those. I think the thing I would most love to win is the set of cookbooks! The cookbooks would be awesome! I love your recipes. Easy and fun. Thanks for all you do! I have two sisters. We love get togethers. I love this swag bag. What a fun idea. Thanks for a great giveaway! Looks like a wonderful trip you all had and an awesome giveaway! You guys are seriously sister goals?? thanks for being such great examples!!!! Very exciting! Sounds like a good time for all of you to be together! I love everything about this giveaway....love the bag and the planner the best of all! !❤️ Thank you putting it all together!! Thank you so much for such a great giveaway. I am most excited for the fawn bag. I just had twin girls this year and I would absolutely love a new diaper bag! Such an amazing giveaway!! ? So hard to choose just one, but I would absolutely love to win the Fawn Design bag!! ? This is fantastic! I hope I win! ? All 7 of the Six Sisters Stuff cookbooks ???? What a fun giveaway! 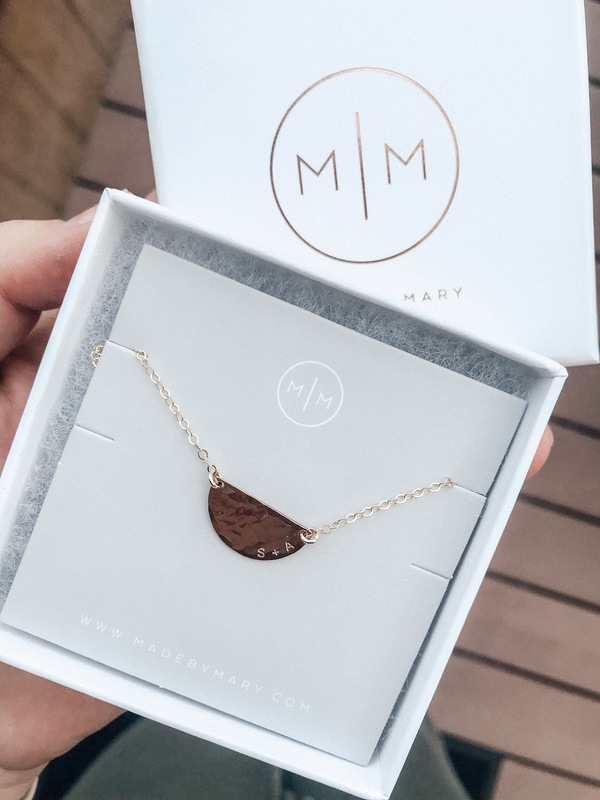 I love all the prizes, especially the Made by Mary necklace! Winning the cool diaper bag for my 1st grandbaby would be wonderful ❤? So exciting! Your girls are the cutest! This is seriously amazing!!! I have 3 sisters and love them to pieces!! It's so fun to watch you all have so much fun together!! Love it!! Oh, and I CANNOT wait for your Copycat Cookbook coming out in September!!!! Thos are all of our favorite places and recipes!!!!!! You ladies look stunning ? How stinking fun!!! Isn’t quality time with sisters the best?! I am hoping luck is in my favor! Love all these items and you guys!! Thanks for sharing with all of us! Everything is so cute! Love those fawn design bags! ? Love the bag! Would be perfect to take for my job as a teacher this year! What an amazing giveaway! Is this only open to U.S. residents? Love all your recipes, by the way! I am so unlucky hoping this breaks the streak ? thanks for all of the delicious recipes and fun ideas around the house. I want to plan a weekend like this for my sisters! Thanks for the fun ideas! I am so excited for this giveaway. I’m definitely most excited for the albionfit gift card because I could for sure use a new suit. This is THE best giveway I have ever seen! What a fun girls weekend , can you adopt me into your family?!!! You ladies are always being awesome. Love the relationship and the creativity amongst all of you! I’m currently pregnant with baby #6 and in all honesty, anything from this glam bag would come in handy for mommy! I love a great giveaway. This is my go to blog for recipes! Love these sisters! Have loved following all of you!!!! An amazing give away!! Such an awesome giveaway!! ?? Wow! Great choices and well put together Sisters! Not an easy choice of what would be best, but I have 3 littles and have been eyeballing the bag for some time! You guys are my go to for recipes! Thank you!! You guys are so sweet!! I mean, it's all amazing! But I think I'd love the Fawn bag and the saranoni blanket the most. But I all of it is amazing, I hope I win! ?? 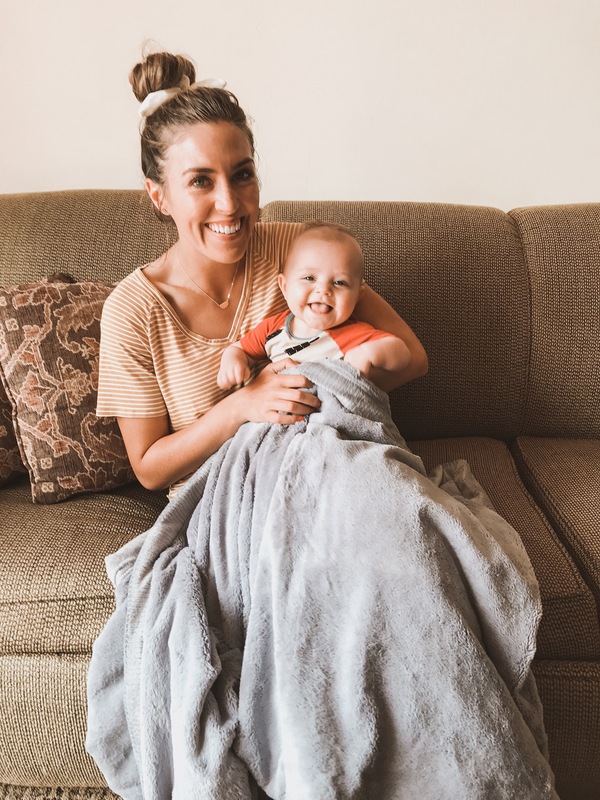 My why is I'm a sucker for a soft blanket and I could use a new diaper bag. Frivolous and practical ? I think I would love the Albion gift card the most, but everything looks awesome! Amazing giveaway! Very nice choices????? I am so grateful to have found you six!!! ? Love, love, ❤️ Everything about this post! Wow this would be awesome! What an amazing giveaway! You ladies are awesome! I can’t pick just one that id be most excited for! Diaper bag is definitely at the top of my list though. And the necklace! SO amazing!!! The fawn design bag and MBM necklace because I'm just weeks away from having my first baby, and so would love a nice diaper bag like that as well as a necklace with my baby's initials!! Such an incredible giveaway and weekend! I'd love it all but I'm a sucker for soft blankets!! I'm dying over everything! What an amazing giveaway. I never enter these, but couldn't pass this one up! How fun! Looks like the perfect weekend! This is amazing!!! So generous - your books are on my wishlist! I mean...Christmas came early with this giveaway. Amazingggg!! Oh how I would LOVEEEEE this!! ?‍♀️❤️? There is nothing as rejuvenating as sister time! But a saranoni blanket every night would help ? What a spectacular giveaway! You guys never disappoint. Thank you! I would love to win the swimsuit! Makes me wish I had sisters... Maybe with my in-laws though. It looks like you had so much fun! Jealous. Such a fun giveaway! So many of my favorite things too! Oh my gosh! This is an awesome giveaway! I would love the Albion swimsuit! I always drool over them! They are so cute!! This is seriously the most amazing giveaway ever!!! I love all of these companies! How fun and super sweet! Thank you! This is amazing! So many fabulous things! This would be a fabulous win!! Just turned 50 and these would be amazing. My daughter would love the bag for my first grand baby!! What an amazing giveaway! I'd love all those cookbooks! You guys just get better and better!! Those blankies look soooo comfy!! I absolutely love following you guys instagram And I love all of your recipes. this seems like an awesome giveaway and I hope to win. I think I’d be most excited about Made for Mary but it’s all such good stuff ... and for a newly single mom of 2 boys my budget doesn’t allow for much “fun” stuff. Such a fun trip! Love all these recommendations! ? Awesome bag and fabulous contents! I need this in my life! What a fun giveaway. You guys are the best! Looks like so much fun! What a great giveaway! This is the dreamiest give-away ever! ? such a fun idea for a getaway with sisters! So many fun things in one weekend!! REALLY makes me want to do something like this with my sisters and mom too!!! ? You guys are adorable!! You have the best recipes! What a thoughtful way to give back, thanks for such a fun giveaway! How fun! I wish I had a sister or two...or five. Oh well, I can always enjoy reading about your adventures together. Thank you for thinking of others! Good luck to all! Looking for a 7th sister?? Because I feel like I would really fit in! But really, amazing giveaway! It is so hard to pick but I think the cookbooks would be my favorite thing to win!! Looks like so much fun. Love you ladies. This is such an amazing giveaway. You guys are amazing. I love following you, so many awesome dinner ideas come from your blog! This is an amazing give away. All of the products look great and would be great to try. This is such an amazing giveaway you guys are awesome!! I love this! Miss you guys! I love you guys so much! I'm glad Ashley met you Lauren so I could hear about you and your amazing sisters! What a fun getaway! I’d love to do that with my sisters someday. I think I’d enjoy the $50 to World Market the most. My husband and I love to pick up little treats there on date nights. I love all of your cookbooks and your giveaways. This giveaway is very generous and exciting! Thanks so much! Beautiful products! Amazing weekend and giveaway! I need to check out World Market! It looks so cute! This is an amazing give away! I would want to win the cookbooks the most. I love trying new recipes and yours always look so yummy! Cutest purse ever and love your cookbooks! This looks so fun! You are all so cute! Oh my goodness! Can I be your 7th sister? what an amazing bundle of goodies! Pick me! This giveaway is awesome! I love that you each added something of your favorite! Cross my fingers, hope I win! Thank you for considering us in your Girls weekend getaway!! This is AMAZING!! Came across you sisters this last year and am in love with your ideas, recipes, etc! Awesom Giveaway! Thank you for the opportunity to win! Awesome! This would be fun. It is so neat that you guys do this with each other. I’m having a baby this week and this would be such a fun gift to pamper myself with after birth! Thank you so much for doing this giveaway! I have had all of your cookbooks in my amazon cart for months, but just haven’t been able to afford to buy them. It would be amazing and so exciting to win them! I’m an only child and I think it’s amazing that you all are so close and have such a great bond! I love Mrs. Call's chocolates! Love all these prizes! What a fun giveaway!! This is seriously an amazing getaway! I wish I had sisters to do something like this! This is amazing! Someone will be blessed!! I’d die for the Saranoni blanket! Ok maybe not die, but close ? The Albion gift card would be amazing! I've heard nothing but great things about their suits but haven't been able to get one yet! So many other amazing goodies from brands I already love too! This sounds like a getaway to remember- I need to go meet up with my sisters and go to park city! Nothing like family time! How sweet to bless one of us! ? That sounds like a FUN getaway!! I would LOVE time like that with my sisters! :) I love the journal (I've never heard of them before - so I'm excited to check them out!) And I love the backpack/handbag!! SO cute!! I’d think I’d love the cozy Saranoni blanket most! What an amazing weekend!! I’m totally planning a girls trip for the girls in my fam now! So fun!! And best giveaway ever! Love you ladies! What an amazing giveaway! Most excited about the fawn bag or Albion goods. But it’s all great! I need that blanket! Looks so soft! I’ve got a girls trip coming up in a few weeks and these are amazing ideas! Love the swag bag and it would be wonderful to get a new diaper bag for my lil man! ? Looks like you had an amazing time. The bag looks awesome! What a fun weekend! I would love to win the albion swimsuit! I've been looking into one for years but haven't commited yet. This is so fun! I would love to get my Sisters/SIL together for something like this! It was so nice that your Mom was able to go too! Thank you for doing this giveaway! What a fun trip! How awesome are y’all to share with someone? What a fun giveaway! I’d love everything!! I love all your favorite things! So cute! An amazing giveaway! Love all of these things! I have four sisters (so there are five of us) and I have loved watching your success! Thanks for the recipes, love & laughs! I'm really digging the Gigi Pip hat! This is so great!! Thank you! I can't pick just one thing I like! They are all so great! I do love the bag though. Girls’ weekends are the best!! I just joined the healthy and Standard meal plans! They are amazing, it has made my life so much easier. I also have some of you cook books and they are wonderful also:) you guys are all so beautiful! You are lucky to have each other. I'd most love the swimsuit because mine is about 10 years old! So many fun and amazing things!!! I love all of these products. This is the cutest! I love Albion Swimsuits and everything else! All of this looks amazing! The bag and swimsuit would be awesome to win. My wife would love to win this giveaway! What an amazing giveaway! I would love that blanket! It’s fun following you ladies. Being apart of the fun via social media. Thanks for all you do. You women are amazing! I love following along on your life’s journey. Plus the recipes are amazing!!! I love this so much! I have 7 sisters and am inspired that we too need to get together once a year and do something like this. What a fun thing! All my fingers and toes are crossed! I hope I win ? Love this and you amazing ladies! Thanks so much for doing this! Whoever wins will be so excited, this stuff is all amazing! You girls are absolutely beautiful and so talented! What a fun giveaway. Such a fun giveaway! Would love to win it! This is such a great give away. Wish there were two bags! Love this giveaway! You gals are so fun! I would love to win all this fun stuff!! I LOVE that six sisters can work together and relax together! I love my sisters too! So sweet to share all of these awesome gifts. Fingers crossed?? You guys are awesome and this giveaway is awesome ? Such great stuff! Would love to win! How fun! What a great weekend. I'd love to get away like that with my sister and mom. This giveaway looks awesome!!! Fingers crossed that I Win! ?? Also so exciting for whoever does win. Good luck everyone!! Such a fun trip! I love having sister trips with no kids! Thanks for the giveaway? This stuff all looms fabulous! Y'all are the cutest!! Love your recipes. When I'm looking for dinner ideas I always look at your site first! This is an awesome giveaway! Fingers crossed!! ?? What a great weekend for you all! Looked like a fabulous weekend! This is an awesome giveaway! I would especially love the bag and the bathing suit! You guys are the cutest!! When I cook ?, I always look at Six Sisters recipes first. My go to for everything. I love watching your videos! Cutest. Giveaway. Ever. Keeping my fingers crossed!! I absolutely love that bag! Oh and the blanket, my little guy would steal it from me for sure. This is an incredible giveaway! SUCH a cute idea! I would love to do something like this with all my sissies!!! ❤️ I would also LOVE to win this giveaway seeing how it’s my birthday month!!! ? What a fun trip! Awesome giveaway too! I would love to win the swimsuit gift card!! Also, the chance to get all your cookbooks is just the cherry on top ❤ You gals are amazing!! I want to just feel those blankets! I've heard so much about them. I would love to see in the cookbooks, most! The recipes are so simple to follow & always delicious for my family of six! This looks amazing! I love Six Sisters. Whenever I want to make anything, I always search your site for the recipes before anywhere else! AMAZING surprise bag!!!! Such a fun idea! This is so cute to see that you sisters did this! I should do this with mine! I love this giveaway. I have loved all the videos with easy to follow instructions. I follow along and pause it/play it as I go. Recipes are always a win at home. I would love to win the bag! Such a fun idea!!!! You guys are the best!!! Seriously love all of your guises stuff! And what a fantastic giveaway!! !